Flipper's in San Francisco's Hayes Valley has been recommended to me several times. Set on the very hip Hayes street amongst edgy fashion and home stores, Flipper's is anything but trendy. As you walk up you notice all the folks eating in the side patio under umbrellas. Inside, there are wood tables and charmingly disheveled interior. I sat down and was instantly waited on by a nice young lady who immediately brought me my Iced Tea. I ordered the Big Flipper burger ($9.25 with fries and salad.) I also ordered onion rings ($5.25) when I was told they couldn't do a split. But when the meal came, she had gotten the split for me. Special orders do not upset them at Flipper's. The burger comes with both Jack and Cheddar cheese. On the side are tomato, lettuce, red onion and a kosher pickle. The burger, from fresh ground chuck, was cooked a little under medium and the meat was delicious. The sesame bun was nicely toasted. The fries were thick steak fries, hot and tasty. The onion rings were thin and crisply breaded. Flipper's is a great place to chillax in Hayes Valley. They also have two locations in Petaluma. Houston's in San Francisco is a national chain of steak houses with a pretty good reputation for food. I was meeting some business associates there for lunch. Jimmy V. told me that the burger was pretty good. I always do what Jimmy V. suggests, so I ordered the Cheeseburger ($14). The burger comes with fries. The menu said it was ground daily from fresh beef. I believe it. The burger was nicely pink. The patty, probably 8 ounces, was covered with cheddar cheese. It sits on a toasted sesame bun and has mustard and mayo. There was also shredded lettuce, tomato slices and onion. I brushed the vegetables aside. The burger was rather salty, almost like it had au jus on it. Overall a nice burger, but nothing special for $14. The fries were excellent. Very thin, almost matchstick size, with skins on the ends. Overall, I think the burger at Houston's is good enough, but not as great as Jimmy V. thinks. But please don't tell him. Joya in Palo Alto is not a burger joint. It is a tapas and small plate restaurant with "modern latin cuisine". My wife, Pat and I went to the restaurant one evening for dinner. The tables were all full so we sat at the bar. This is a great room. Front lanai doors were opened up to the warm evening. The cool bar was crowded. We found two chairs and checked out the menu. 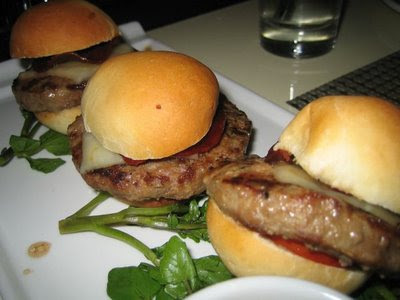 I could not resist the Kobe Beef Mini-Burgers ($11). The burgers were served artfully on a white plate. They have Oaxaca cheese, soria chorizo and chipotle mayonnaise. Our first bite revealed a luke warm burger. We sent them back. When the next set came out they were hot. The burgers had a charcoal taste and a weird aftertaste. Probably the chorizo. I wasn't too crazy about them. The couple sitting next to us had ordered them too and liked them a lot. 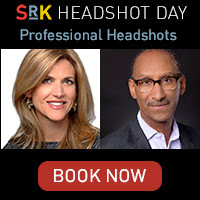 So maybe they just didn't hit me right. We struck up a nice conversation in the relaxed, sophisticated atmosphere of Joya and enjoyed sipping our wine and eating our other food. Joya is a great place to kick back with friends and enjoy an evening out. But maybe focus on the latin food. 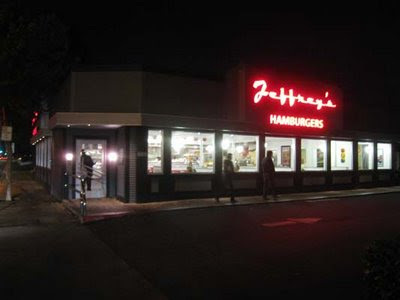 Jeffrey's Hamburgers in Menlo Park is a great venue. The restaurant is a retro blend of steel, red laminate and great lighting. I can't think of a nicer place to have a burger and the throngs that migrate there from open until close every day must agree. The only catch is, I was never too crazy about the burger. It always seemed a little bland and unimaginative although very well prepared. It is made from fresh ground chuck, just like it should be. The bun is a white bun, nicely grilled. 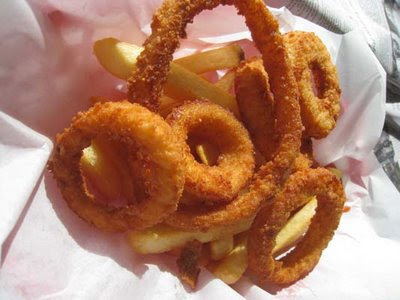 The onion rings ($2.99) are fantastic crunchy, yummy perfect. The fries ($1.39) are good medium cut fries. Jeffrey's have a nice condiment bar. Having tried several combinations, I gave it one more shot on a Saturday afternoon. 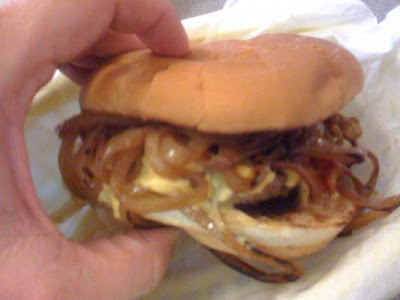 I ordered the Bacon Cheese Burger and added the grilled onions ($7.99). When my burger came, I put some brown mustard and ketchup on it. I dug in and realized I had finally hit the right combo. The American cheese blended with all the other flavors in a perfect balance. The mustard-ketchup combo kind of created the special sauce that I always thought Jeffrey's needed. I am now happy to know that Jeffrey's, practical walking distance from my house, is a reliable burger fix whenever I want. Jeffrey's San Mateo was reviewed previously. Sorry about the lousy burger photo. I took it with my phone since I wasn't expecting to do a review. Juicy Burger in Santa Clara was my accidental choice. 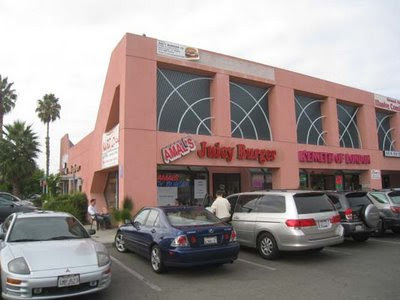 I was headed for Chubby Burger in Sunnyvale, which had great reviews on line, but I was sad to find it closed when I pulled up. 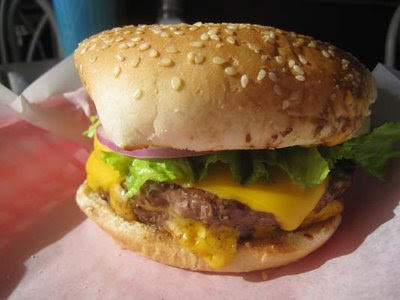 I typed "Best Burger" into my iPhone and found Juicy Burger to be the closest non-chain. Set in a pink strip mall on El Camino, it wasn't hard to find. As I pulled up I noticed a sign in the window that said "Recession Burger". There was another sign that said "Vegan Luncheon". Knowing that someone had a sense of humor, I was encouraged. There were three guys eating at the larger of two sets of unmatched tables. The fellow at the counter took my order of one 1/2 pound Super Juicy Burger ($6.65), Fries ($1.90) and Onion Rings ($3.75). I asked if he could give me a half order of fries and onion rings and he accommodated me. I took my table and looked around. The place is a little seedy, but generally clean. Some kittens outside the window meowed at me through the glass. On one side of the restaurant the walls are covered with posters of bad guys. Al Pacino as Scarface. The Sopranos. Barry Bonds. Stephen Jackson. On the opposite wall it was all good guys. San Francisco 49ers for the most part. The burger has two patties of beef stacked up and cooked through. I think they start frozen, but I am not sure. They were charcoal broiled with American Cheese on top. The sesame bun was nicely grilled. I topped it from the amply stocked condiment bar that included lettuce, tomato, onions and most of the other things you would suggest. Everything looked very fresh. I must say the burger was fairly unremarkable. Although it was well prepared and hot and the condiments were fresh, it just didn't excite me. The fies were so hot I burnt my tongue. Maybe that is why they didn't seem to have much flavor. The onion rings were overcooked, standard-issue, breaded frozen o-rings. Overall I would say that Juicy Burger is OK in a pinch, but I wouldn't make a special trip back. I am still looking for great burger in the Santa Clara / Sunnyvale area. St. John's is the best so far. By the way, I asked about the recession burger. The guy at the counter shrugged and said it is a bun and lettuce. 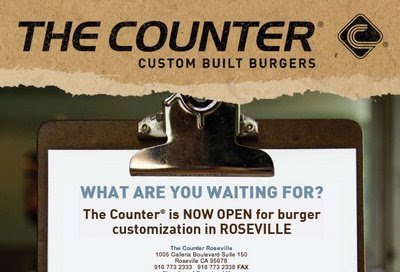 The counter is now open in Roseville, with another one coming to Corte Madera in 2009. See my review of the Counter in Palo Alto and in San Jose. 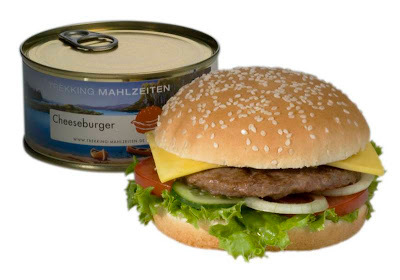 Also they have a cool graphic of a hamburger building itself on their website. 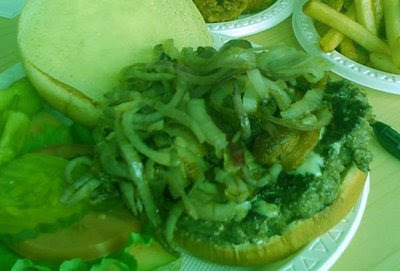 Check it out at www.thecounterburger.com. A HoosierBurgerBoy reader recently logged onto the blog and asked me the best way to make an American burger for their new restaurant in Mallorca, Spain. Here is the response I posted. 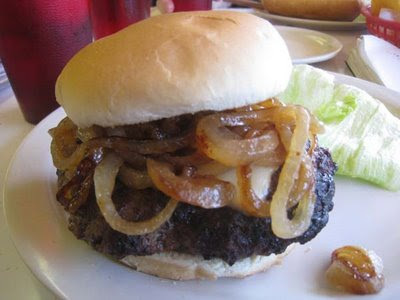 I would love to get any comments back on what you would put down as the recipe for the Classic American Burger. 2. Make sure you serve it on a white enriched bun. Not a brioche, or roll or other type of bread. 3. 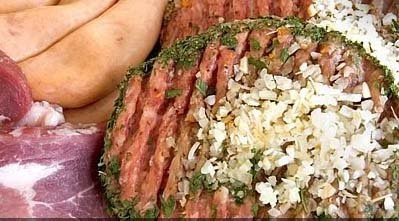 The patty should weigh between 1/3 and 1/2 pound pre-cooked weight. Good luck and send me a story and photo when you are done. I will put it on my blog!